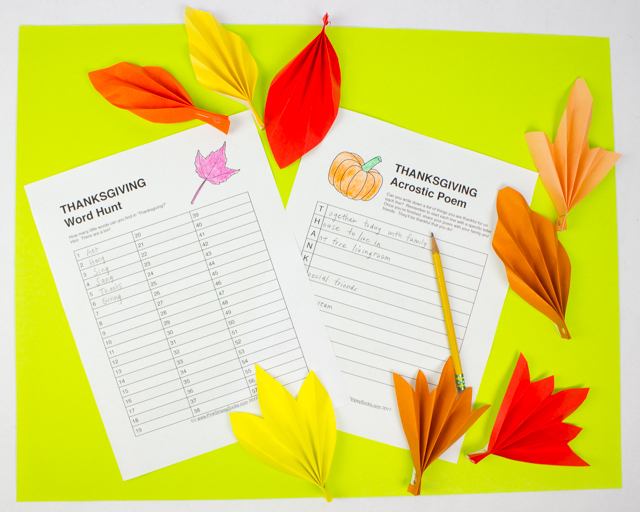 Looking for another easy Thanksgiving craft? 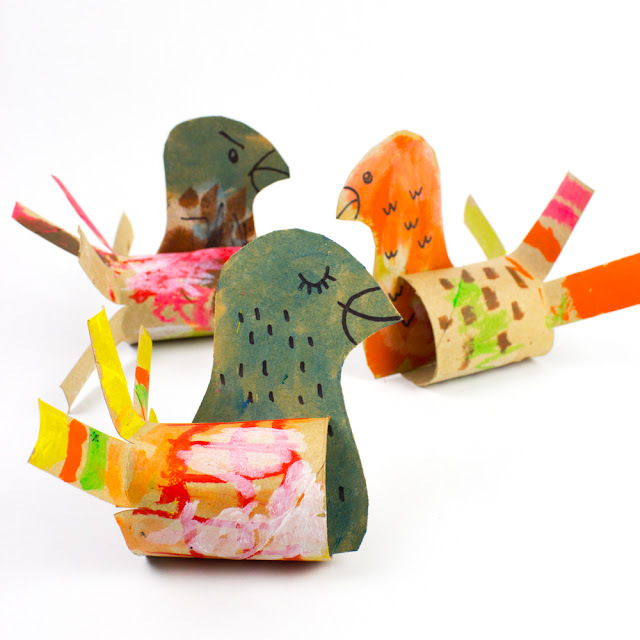 Grab your cardboard rolls and make these super simple turkeys using everyday materials: toilet paper rolls and cereal boxes! A great kids craft, crafters of all ages from toddler to adult will certainly enjoy making and decorating these Fall fowl. Today's fall art idea is simple, beautiful, and fun to make! Tada! We're adding to our growing list of fall crafts with these glittery and gorgeous fall leaves! This colorful and beautiful Thanksgiving Banner is easy to make and will look beautiful hanging up this holiday season! And guess what? It's made from everyday materials like washi tape, paint chips, straws, and popsicle sticks! Hubby and I just finished watching Sound of Music. Wow! That was really a marathon of music. I can't believe that the singers had the stamina to last three hours. I felt exhausted just watching them! Back to today's post. Here are the promised Thanksgiving photos. Ermm.... looking through them, I realize now that they're mostly of food. I gave hubby the camera for the night while I hung out with the kids. He came back with lots of food photos... so you could tell what he was mostly focused on. :) Just imagine some people congregating around the food and then you've got the gist of our Thanksgiving. I took this photo before the evening's events. Chuck just looked too adorable and I knew that the outfit would be covered with food by the end of the night. Are you more of a sweet or savory person? I've always been a savory type of gal. I like eating sweets occasionally, but I always have room in my tummy for salty snacks. Anyway, back to this post. This Thanksgiving (which shall hereafter be called "Cakesgiving"), everything changed. Our aunt (yah, the same one that made Chuck's Hungry Caterpillar cake) fully embraced our new dietary restrictions and made a gluten-free triple layer carrot-cheesecake-carrot cake. One bite and I felt myself leaving my body and floating away to sugar heaven. Carrot cake? Ooh yeah, it was delicious and moist. Cheesecake center? Um, yes please. It's was creamy with just a bit of tang. And that cream cheese frosting? To. Die. For. I never got a chance to get the recipe. Rats. But fortunately, I did take tons of photos of her making it. (This was me "helping" out with Thanksgiving preparations.) 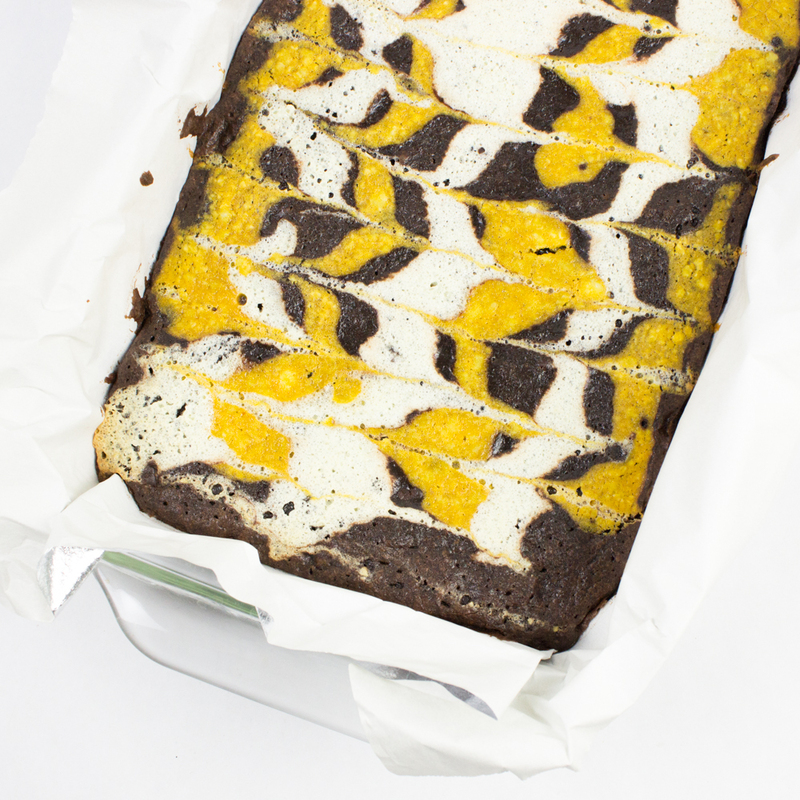 So, dear reader, I present to you some delicious cake photos. I'm totally drooling. Oh baby, whisk that icing! Ack. My toes are curling. If only they I had taste-o-vision. Then I could reach in and take one more delicious bite. It was really the best cake I've ever had. I don't know about you, but it's time for me to cool myself off with a nice cold glass of milk. Did you have a good Thanksgiving? I hope so. Hubby, Chuck, and I had a pretty busy holiday. We "helped" one aunt with Thanksgiving preparations (Erm.... does munching on food and chatting count as helping? Tee hee hee....). And on Thanksgiving we celebrated by eating two back-to-back Thanksgiving lunches. Yah, our car definitely sat a bit lower that day. It was so nice seeing everyone and meeting our new niece. She is just so sweet and precious. Even though it's only been about a year since Baby Chuck was born, I forgot how small newborn babies are. Hello sweet baby. It's so good to finally meet you. Cold smoothie = Brain freeze! I hope you have a wonderful Thanksgiving filled with friends, family, good food, and long turkey-induced naps. I'll be stuffing my face and snapping lots of photos to upload next week. To keep the Thanksgiving spirit rolling, here are some photos from our Toddler Time Thanksgiving party. Once again the teachers were super sweet and threw a great bash for the kids. And, if you have even more moments to spare, would you mind voting for my reindeer head craft (number 4) in the Totally Green Crafts contest? Their polls will be open until Sunday. Hope your Thanksgiving Day preparations aren't too hectic! Last night I finally succeeded in crapting a cardboard roll kaleidoscope. Yes! Please excuse me while I do a happy dance. My crapting dreams finally came true. This was actually my fifth attempt at making a kaleidoscope. Yup, I tried four previous iterations and failed miserably. So here's a big virtual thank you to Genuine Mudpie for her beautifully detailed and photographed set of directions. Back to what I was saying... this Friday our local library is holding a special Thanksgiving party for the babies and toddlers. Last month they put together such a nice Halloween party, so we're really looking forward to seeing what surprises are in store. I wanted to help contribute to the festivities. After finding this great paper plate hat tutorial from Alphamom, I made a whole flock of turkey paper plate hats for the kids. Note: This was like the only good photo that we got of Baby Chuck wearing the hat. It's a miracle that he sat still and din't rip it off. Last month's mochi flavor was pumpkin. This month I'm channeling the Thanksgiving spirit and made cranberry mochi cake. What? Are those sounds of disbelief I hear? Hubby shared your similar fears, but after trying my first batch he ate his words (and nearly a fifth of my mochi cake!) I can't blame him. The cake was chewy, sweet, and tangy. - Grease your pan well because the cake is super sticky. I used a jelly roll pan, so my cake was pretty thin. - Mix the first four ingredients together well. - Mix in the whole can of cranberry sauce. - Bake for approximately 45 minutes (or until the edges are slightly brown). - Let cake cool. Guard it from hungry husbands. Hi everyone. Did you vote yesterday? I took Baby Chuck into the voting booth. He wasn't too sure about the candidates, but he was very excited about pushing the buttons. I think this is my favorite crapt so far. It's pretty, cheery, and colorful. It's also super easy to make. Step 1: Get yourself an egg carton. Step 2: Cut the lid up into leaves. Step 3: Cut the egg cups up into different flower shapes. Like kids crafts and activities? Then you'll definitely want to check out this awesome craft ebook! It contains 115 pages of unique crafts written by 18 kid craft loving moms! And, it costs only $12.99!